In Monday's post I mentioned how there's always one fruit and vegetable that stand out to me every season. 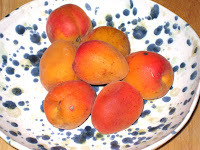 Well, the runner up in the fresh fruit event (sorry, too much Olympics) this year is the apricot. I have always had a bit of a love/hate relationship with apricots. Growing up, all we ever saw came dried in a bag, in halves. Halves that looked like ears. And, to my tender tongue, tasted a little like I imagined ears tasted, too. They had a sharp tartness that bit into the back of my jaw, and they were more tart than sweet. I guess apricots are to peaches what kumquats are to oranges. One year a friend of my mother's brought over some treats she had made from a new recipe. When I found out they were apricots, I was less than enthused. But one bite was all it to took to convert me. Turns out apricot jam is nice and sweet - not even a hint of the tart. But while I loved anything made with apricot jam (including buttered toast), I still avoided dried, and can't recall ever seeing fresh. I ran into my first fresh apricots after I moved to Chicago. They were so pretty that I bought a couple, curious to see what they tasted like when fresh. They still had that bite, but it was not as strong. And the flavor was lighter and a little sweeter than the dried as well. They were actually pretty good. And they are all over the green market this year. I brought some home with me a couple of weeks ago and admired them while I thought about what I wanted to do with them. I knew I wanted to put them with something savory, like chicken. I also knew they might need a little sweetness to round out the flavor. I also knew that I had this beautiful jar of raspberry honey Nicole had given me. And there I had the beginnings of an idea. 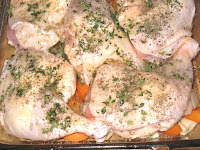 Baked chicken with apricots and honey. After turning on the oven to 350 degrees F., I chopped two onions into large chunks and laid them into the bottom of a 13 x 9 baking dish. I cut the apricots in half, removed the stones, and then cut each half into slivers roughly the size of mandarin orange sections. I also took a head of garlic apart and peeled the cloves, arranging them between the onions and the apricots. I seasoned it all with salt and pepper. I had the butcher at the Apple Market cut up a whole chicken for me. I washed and dried the pieces and then layered them over the apricots, garlic and onions. Then I seasoned the chicken with salt and pepper, took the leaves over some more fresh thyme, chopped them up and spread them over the chicken. I also added some dried marjoram. I drizzled about 1/4 cup of the raspberry honey over the chicken, being sure to let it slip between the pieces so it would cook into the apricots and onions. I covered the dish with foil and baked it for about 45 minutes, then took off the foil and cooked it for another 1/2 hour to let the skin crisp. 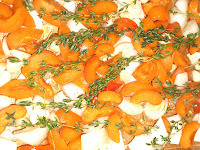 When it was done, I took the chicken out and picked all of the thyme sprigs out of the apricots and onions, which I then put into a 3-quart saucepan with all of the chicken drippings and let it come to a boil. After it had cooked down for a while I blended it with my hand blender and then strained it. While it was baking I cooked up some brown rice and the Boiled Fingerlings with Lemon, Garlic and Parsley I wrote about here. This turned out really well. 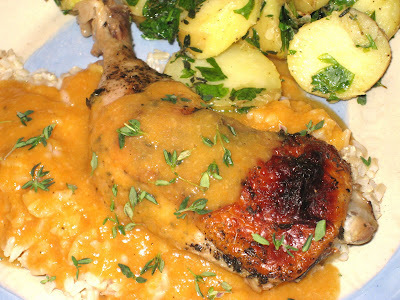 The apricots and honey were the perfect blend of sweet and tart, and made a wonderful accompaniment for the chicken. It was all beautifully rounded out by the thyme and marjoram. Rice and potatoes might have been one more starch than was necessary, but that's what happens sometimes. The only thing I would do differently is that I would put the honey in before I added the chicken. The skin browned a little too well, on the verge of burning, with all of that sugar on it.